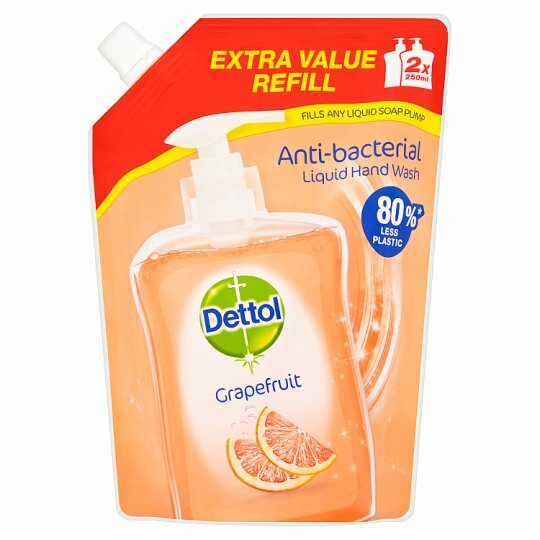 *based on plastic weight (grams) compared with 2 x 250ml Dettol bottles. **Base formulation has been tested. 1. Unscrew the cap from the refill pouch. 2. Pour content into the empty Dettol Liquid Hand Wash bottle. 3. Close the bottle pump carefully. 4. Close the cap of the refill pouch. 5. Wet hands and pump twice in to your hands. 6. Rub hands together for at least 30 seconds ensuring total coverage with lather, not forgetting nails and thumbs. 7. Rinse well with water. 8. Do not refill bottle without rinsing. SAFETY INFORMATION: For external use only. Keep out of reach of children unless under adult supervision. Avoid contact with eyes. In case of contact with eyes, rinse immediately with plenty of water. If persistent irritation occurs, get medical attention.